This extraordinary image of an apparent floating city has created a stir among conspiracy theorists, but a well-known optical illusion is the likely explanation for the phenomenon. 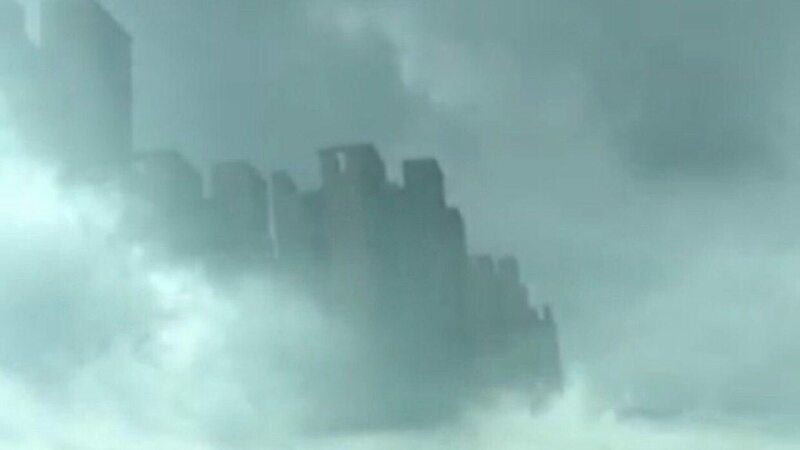 As reported in the Independent, the bizarre cloud formation appears to show a cityscape high above the city of Foshan in China’s Guangdong province. Footage of the phenomenon appeared on Chinese TV last week and was apparently witnessed by hundreds of astonished onlookers. The sight lasted for only a few minutes before disappearing. A few days later, a similar cloud city was seen in the province of Jiangxi, China. Scientific observers are arguing a case of fata morgana, or a mirage. The phenomenon occurs at the location of a thermal inversion, or when warm air is found on top of cold air. Light rays become bent when passing through varying temperatures in this patch of air, causing the illusion. Mirages have been spotted on horizons for centuries, yet the footage provided does not quite fit the bill, seeing as it is seen much higher in the sky than typical optical illusions. Finally, one plausible explanation is that the whole thing is a hoax. Given that there is only one video record of the event, even though it is reported that hundreds or thousands of people witnessed the event, this seems very likely. What do you think this floating city could be?